Before I started having problems with my hip, Debbie and I would often take power walks together. We were walking with a purpose—to get in better shape. However, the walks always produced a wonderful side benefit: time together to talk and share and work as a team. Our marriage is always the strongest when we have undistracted, unhurried, quality time together. The Christian life is described as a walk with God. It is not a sprint or a jog, but a walk. As we walk with God, talking to Him through prayer and praise and listening to Him talk to us through His Word, we grow stronger and closer in our relationship with Him. What’s involved in a walk with God? 1. You go in the same direction. When Debbie and I went on a walk together, we were going in the same direction. The Bible asks this rhetorical question, “Can two walk together, unless they are agreed?” (Amos 3:3). Of course not! To walk with God means I am going where He is going. I am yielding to Him in all areas of my life, walking in the light with Jesus. 2. You go at the same pace. When Debbie and I walked together, we stayed together. She did not outpace me, and I did not outpace her. We stayed together step for step. That is the way it is to be with God. He is not racing us, He is walking with us. We dare not get ahead of Him by plotting the course. He plots the course. Furthermore, we dare not lag behind Him by failing to move forward. Our job is to stay with Him. 3. You go for the purpose of getting in shape and growing closer. As you and I walk with God, we grow closer to God. As we spend time with Him, sharing our inner self with Him and really listening to what He has to say, we draw near to His heart. We get to know Him better and start to become like Him. I love what the Scripture says about Peter and John when they appeared before the Sanhedrin, “Now as they observed the confidence of Peter and John, and understood that they were uneducated and untrained men, they were marveling, and began to recognize them as having been with Jesus” (Acts 4:13). When you walk with God, people notice the difference. 4. You go until He takes you home. Walking with God is a lifelong process. It is not a destination, but a journey. Enoch walked with God—for 300 years! And God loved every day of it as Enoch pleased Him with his faith and obedience. One day on the walk, God just took Enoch to Paradise. Wow! Did you know that same scenario plays out for every believer? If Jesus tarries His coming, God will call each one of us home when our earthly assignment is completed. But when Jesus does come in the clouds, every Christian will be taken up just as Enoch was. We will be raptured in the twinkling of an eye. How cool is that!? So here is the big question: are you walking with God? I’m not talking about religion, I’m talking about relationship. Are you spending quiet time with God each day? Are you letting Him direct your paths? Are you sharing the inner you—your hopes and dreams and secrets and fears and faults and failures—with the God who made you and loves you? If not, you can start today! The King of all kings invites you to walk with Him. What a tremendous privilege. What an invaluable opportunity. And what a colossal waste if you say no. To say thanks for your support this month, we’d like to send you this brand new series on understanding yourself and how God can use you for His glory. It’s called IT’S NOT EASY BEING ME. 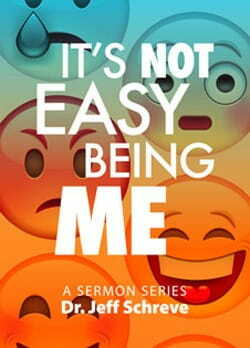 These lessons will encourage you and show you things about your personality that will help you rejoice in the way God made you. We’ll also include Jeff’s encouraging booklet, WHEN YOU DON’T LIKE YOURSELF, when you send your gift today.